WASHINGTON, D.C. – January 27, 2014 – (RealEstateRama) — Once suffering from blight and high concentrations of poverty, one of Anchorage, Alaska’s oldest neighborhoods is now a thriving mixed-use commercial corridor, providing residents with affordable housing and jobs while stimulating the surrounding local economy. 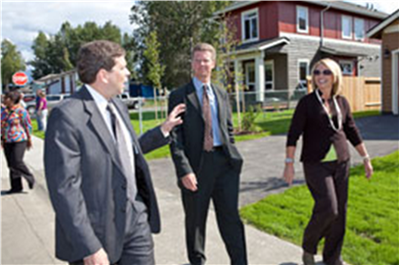 Today, the U.S. Department of Housing and Urban Development (HUD) and the American Planning Association (APA) announced the Cook Inlet Housing Authority (CIHA) will receive the 2014 HUD Secretary’s Opportunity and Empowerment Award for its dramatic turnaround of the historic Mountain View Village community. Presented jointly by HUD and APA, this award honors excellence in community planning resulting in measurable benefits in terms of increased economic development, employment, education, or housing choice and mobility for low- and moderate-income residents. Emphasis is placed on how creative housing, economic development, and private investments have been used in or with a comprehensive community development plan to empower a community. CIHA identified Mountain View Village as the best location to enact a revitalization program. With the highest Alaska Native population in Anchorage, Mountain View Village also had the highest level need and lowest income. CIHA collaborated with the Mountain View Community Council (MVCC) to align the two organizations’ redevelopment preferences, and offer citizens an active role in the planning process. MVCC’s goals included decreased absentee landlordism, increased homeownership, and demolition of blighted, deteriorated, or vacant structures, all of which have been accomplished under CIHA. CIHA selected a scattered site development approach so the housing improvements were not limited to a single block or area of the neighborhood. In the homes they have built, CIHA has utilized a variety of housing styles, colors, and designs. Front porches and exterior lighting are included in every home to deter crime, and landscaping and fencing are used to present barriers to unwanted foot traffic. Families of all sizes can utilize these newly developed residences, as spaces range from studio apartments to four-bedroom single-family homes. Since 2003, CIHA has also coordinated development efforts along Mountain View’s commercial corridor with the Anchorage Community Land Trust (ACLT). By working in alignment, CIHA and ACLT deployed complementary strategic funding. The result is Anchorage’s first successful mixed-use commercial corridor, which provides residents with nearby goods and services while simultaneously stimulating the local economy. CIHA has invested $84 million in Mountain View in land acquisition, redevelopment or development of rentals and immediate homes for sale, and low interest financing for homeowners. CIHA’s revitalization efforts include the demolition of 130 blighted structures, building in their place 277 affordable homes. A total of 51 new single family homes have been built for immediate home ownership—50 of those have sold. To date, CIHA has redeveloped a total of 10 percent of all residential units in Mountain View Village. Watch the story behind the transformation of the Mountain View Village neighborhood. CIHA and ACLT recently completed a social and economic impact study to assess the progress of the last eight years of joint revitalization work. Early results show more people choosing to live in Mountain View and staying in their residences longer. Household incomes are on the rise, and local schools are seeing increased parent participation and better student test scores. Stabilizing the housing needs of the residents and investing in creating business opportunities on the commercial corridor has clearly had positive effects. The 2014 HUD Secretary’s Opportunity and Empowerment Award will be presented at APA’s National Planning Conference in Atlanta during a special awards luncheon on April 29, 2014. The award recipient also will be profiled in Planning magazine, APA’s flagship publication.